rectilinear Palm Court as an “Apollonian island in a Dionysian jungle”,” Lundell asked. “That kind of tension seems about right.” (Not only is that strip around the top of the building now brown but in recent years they also added the handrails pictured.) Photo via Cassie Manz. To put the Pei dorms into historical context, Alan Burr, director of facilities and construction at Physical Plant, explained it to me like this: when the first class of New College enrolled in 1964, College Hall was 38 years old. 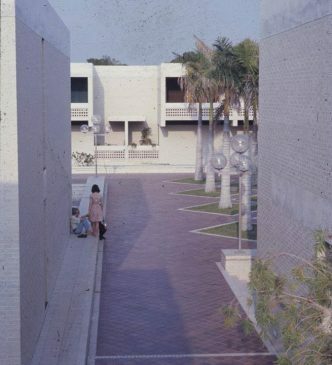 The Pei dorms, finished in 1965, are now 52 years old, older than College Hall was when the college was formed. With a half a century of use under their belt, the dorms have begun to exhibit signs of old age, most notably in First Court. From one perspective, Pei accomplished his goal: in 2015 the dorms housed their fiftieth class of students. For a university as young as New College it was a significant anniversary. However, in recent years many have raised questions about the dorms’ age, sustainability and future. I.M. 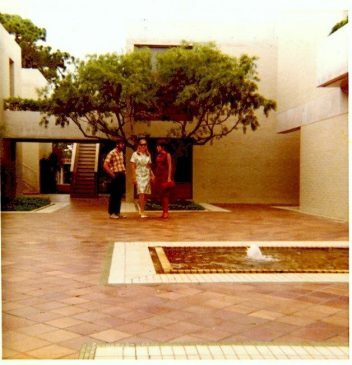 Pei’s residence halls are considered part of the Sarasota School of Architecture and have a significant place within the architectural community. He’s included in the ranks of other well-known, and beloved, architects in Sarasota including Paul Rudolph and Victor Lundy. The fact that the same person who designed the Louvre Pyramid in Paris also designed a set of college dorm rooms adds some credibility to Sarasota’s standing in the architectural scene. “Even if it [the Pei dorms] wasn’t officially considered [historical], local architectural culture would want to make sure it got preserved so we have not made any plans to tear them down and we would like to come up with the money to properly renovate them,” Burr said. In 2007 Physical Plant renovated Second Court. They redid the interior finishings, upgraded the air conditioning system from a two-pipe system to a four-pipe system and created showers on the first floor. A four-pipe system is more equipped to deal with humidity, as well as the temperature inside the room; most of the rooms in Third and First Court still have two-pipe systems. They didn’t get to install the 4-pipe AC system because of time and financial constraints, but otherwise did almost the same renovations they had done in Second Court. Burr reported they still have issues with expansion cracks on the exterior of the buildings and that the envelope of the building is not as watertight as they would like. One of the significant changes of the Third Court renovation was replacing the notoriously slippery red tiles in the courtyard with concrete pavers. Like many things at New College that have stayed the same, the red tiles have always been a liability during a rainstorm. One of the biggest issues Physical Plant is dealing with in each court (but not each room) is a bad detail on the second floor decks and sliding glass doors. “On the second floor there’s a construction joint where the deck meets the floor of the building and that doesn’t have a water seal in it so when it rains heavy sometimes water comes from the deck and it goes through that or it goes through the sliding glass doors and into the interior and then it goes down to the room below and it rots the ceiling out, right above the skinny window,” Burr said. This issue has been ongoing since the first class moved into the dorms. 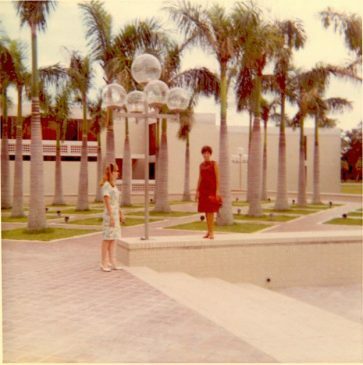 According to alum Cheryl Soehl (‘65), flooding and mold were a problem from the beginning. The renovations in Third Court cost around $2 million. Adding the 4-pipe system would be another million. To renovate First Court it would take about $4 million, although five rooms in First Court were renovated over the summer. Burr reported that Second Court also needs some updates. 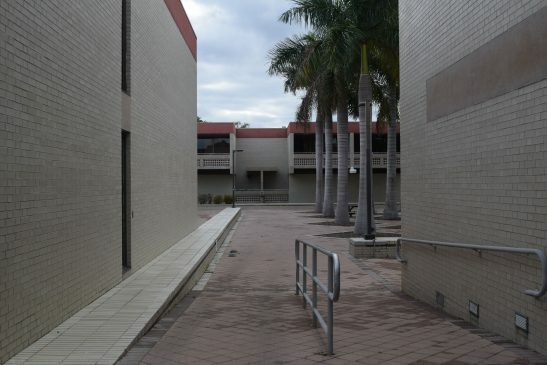 According to Burr, the state of Florida does not financially support Housing like they do the educational aspects of the school because Housing is considered an auxiliary – students pay for housing separate from the amount they pay for tuition. “They’ve struggled financially to take care of housing and you can see it right there,” Burr said, referring to the details around the First Court bathrooms. Despite cockroaches and a rotting carpet in his room, Steve Barbeaux (‘88) still enjoyed the Pei experience. Hopefully First Court will get the makeover that it’s long been due, but until then it seems New College students will continue to get by, enjoying the Pei rooms, or rather the experience they create, even with their flaws. Information for this article was gathered from questia.com.